Before we get into the meat of this piece, a bit of technical explanation is needed. Frequency Divided Multiple Access (FDMA) allows the use of two channels within a 12.5kHz chunk of spectrum. As its name suggests – the two channels are separated by frequency. 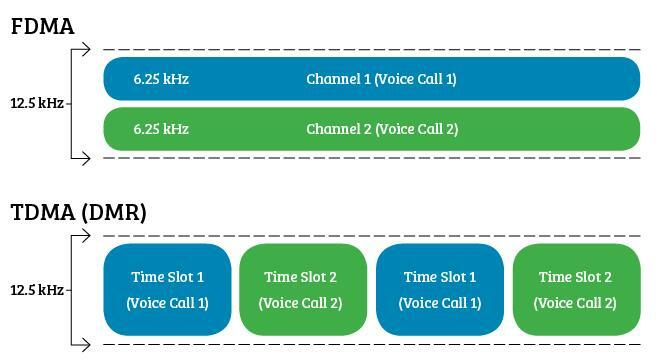 In contrast, DMR uses Time Divided Multiple Access (TDMA) technology to divide the 12.5kHz channel into two time-slots, giving the same effective capacity (see the diagram below). There are two main technologies on the market that use FDMA: dPMR and NXDN. dPMR is an open standard developed by ETSI as a low-cost, low-complexity technology. NXDN is an ITU standard and has been implemented by Kenwood as NEXEDGE and by Icom as IDAS. It can operate in 6.25kHz or 12.5kHz channels, while dPMR uses only 6.25kHz. Time and the unceasing efforts of two-way manufacturers’ R&D departments have eroded a lot of the differences between FDMA technologies and TDMA (DMR) from an end-user’s perspective. “Both dPMR and DMR air interface protocols have developed significantly since introduction. DMR now has options to provide simple and inexpensive systems, while dPMR can offer multi-site and wide area systems-based solutions including Mode 3 trunking,” says Mike Atkins, director at Kenwood and chair of the dPMR Association’s marketing group. The lines have been further blurred by the fact that manufacturers can offer radios that can support multiple air interfaces; for example, Kenwood offers two-way radios that support NXDN, DMR and analogue. In addition, Kenwood’s (mid-tier) and Icom’s (currently available) NXDN equipment are upgradable to dPMR. Pete Hizzey, chairman of the dPMR Association, explains that this is aided by the fact that while dPMR and NXDN are separate air interfaces, they run off the same hardware. “You could think of an IDAS radio as being like a PC and you can either load it with NXDN software or dPMR software, but the hardware is the same,” he says. However, subtle differences remain. For example, FDMA technologies have slighter better range than their DMR counterparts, though this results in slightly less battery life – but in Hizzey’s view this is a worthwhile trade off. “There’s a slight difference, because TDMA only transmits for half of the time [of FDMA], but with dPMR you’re operating with narrower bandwidth, which gives higher sensitivity, so if you have the option, you can turn the power down for equivalent performance. That would give you increased battery life, but users are typically more concerned with having the [maximum] range [possible], so they’re not concerned about backing off the power a bit to get quality of battery life. Atkins confirms that over-the-air programming (OTAP) is available with dPMR, and that while it is often useful when providing communications for events, it is crucial for public access systems; for example, if a customer hasn’t paid their bills and needs to be disconnected from the service, or if they need to expand their radio fleet. “dPMR has proved itself in the UK in the licence-free dPMR446 format and in countries where 6.25kHz channel allocations are made. For example, we have dPMR trunking systems in operation outside the UK, where a user specifically needed to create a trunking system, and the only way that the authority could give them the right frequencies was by allocating a block of 6.25kHz channels, so dPMR was perfect. It really depends on the exact needs of each user,” says Atkins. Ian Lockyer, Icom UK’s marketing manager, says both conventional and trunked dPMR systems are in use in the UK, Spain, Germany and many other European countries. He adds that dPMR users span a wide variety of sectors including prisons, humanitarian organisations (the UN is one of the biggest adopters of dPMR), security companies, nuclear facilities, wharfs, transport and municipal councils. He notes that most radio licences are priced by spectrum, meaning that “if you’re only using a 6.25kHz channel, the odds are that you can get a cheaper licence than if you want to have a whole 12.5kHz channel”, as would be the case with DMR, “unless you can find somebody else who can share the other timeslot, but that would be hugely unworkable”. I ask Atkins why, if there is so much similarity between DMR and dPMR from an end-user’s perspective, Kenwood continues to sell both technologies. “It’s because we want to be able to supply the best system for the user,” he explains. “When a requirement is reviewed, it’s obvious which [technology] is best for [it]. Being able to provide the right system for each application is the goal. “Because DMR has more manufacturers and hence more marketing power, a lot of users just take DMR as the default option (much as IT buyers did with IBM in the past), so, speaking as Kenwood, we often have customers that come to us saying ‘we want DMR’, and with many of those, we’ll offer them DMR where it’s appropriate. “However, where it’s less clear-cut or where dPMR is more suitable, that’s what we’d recommend – it all depends on a multitude of factors, such as the coverage area, the size of the system, the features and the facilities they want. Another misconception that Atkins is keen to flag concerns the extent of Kenwood’s ongoing support for dPMR. He says: “It is Kenwood’s aim to offer customers the right communication solution to meet their needs irrespective of the ‘flavour’ of the technology or protocol. The quantity of proprietary features that many manufacturers layer on top of the DMR standard requires would-be users seeking to mix infrastructure and terminals from different manufacturers to look carefully at which features they need and which will work in such an environment. While dPMR and DMR have both matured to the point of encroaching on each other’s original territory, perhaps this is to be welcomed as the competition it creates benefits end-users and the wider industry alike. It also highlights the fact that when you are looking to buy a new radio system or make the transition from digital, there is no harm in talking through all the options with your supplier. “As all analogue systems are FDMA, there is no fundamental change of the technology [when migrating to dPMR],” says the dPMR Association’s Pete Hizzey. This allows dPMR terminals to be added one at a time – a soft transition from analogue. “If you try to do this with DMR, it’s TDMA, so a new base station is needed.” He adds that from a passive component perspective, there can be a higher cost with FDMA tech if the network uses multichannel equipment on a single antenna. Do consider dPMR if you need a simple system for fast deployment. Do remember that FDMA technologies offer a slight range advantage over analogue and TDMA – this may be particularly useful for (d)PMR466 users and when dealing with areas that are particularly difficult to cover. Do note that dPMR’s ecosystem is similar to that of DMR in that ATEX, trunked and non-trunked versions and many functions including over-the-air programming and alarm integration are available. Do see if you can speak with an end-user who is using dPMR or NXDN with similar requirements to your own to get their perspective if you have any concerns. Do involve the staff who will use the system in the decision-making process. Don’t assume that FDMA technologies can’t be used in Europe – they can. Don’t make the mistake of thinking that DMR is the only option when it comes to digital radio. Discuss with your dealer whether dPMR might be a better fit for your requirements. Don’t forget that dPMR and NXDN are different FDMA technologies.